During the holiday season, my kitchen sees more activity than any other season of the year. There are cookies to bake, roasts to …well… roast, and holiday meals to prepare. All of that food preparation can lead to kitchen chaos and stress. I’ve hosted many a holiday meal, and the more prepared I am in the beginning, the less stressful holiday cooking becomes. And honestly, who wants to be a stressed out mess baking in the kitchen while everyone else is having holiday fun? Not this person, for sure. So what are my preparation tips for stress free holiday feasts? Tip! Want to save some money? Right now, Best Buy has a great deal on where you can save up to $600 on the LG Kitchen Appliance Package! Just mosey on over to this link to check it out. Plan a menu that fits your abilities and time frame. If you’re crunched for time, don’t make cranberry sauce or stuffing from scratch. Many people love canned cranberry sauce and stuffing, anyway. Similarly, if you’ve never cooked a turkey before, either allow lots of time for reading instructions and prep, or buy a pre-stuffed turkey. Clean your kitchen of clutter. Take a look in your fridge, and clean out all of the expired salad dressing, condiments and the like. I won’t judge; I probably have three bottles of salad dressing that expired in 2016 in mine. The same goes for your pantry. Dig out your holiday baking and cooking gear. Now’s the time to dig through your cupboards to make sure that you have the right size roaster, enough bowls and serving spoons, a gravy boat, an icing bag and tips, and the like. I’ve learned from experience that discovering you don’t have a pan to fit your roast on Christmas Day is not fun. Wash holiday dishes, flatware, glasses and linen. You know that weird film that sometimes develops on unused glasses in the cupboard? Now’s the time to get rid of it. I’ve been stuck washing a sink full of holiday glasses at the last minute, and it just adds to the stress. Get it done early, and you’ll have a more relaxed holiday. When we go shopping for holiday meals, we tend to focus on food and drinks, and forget the basics. Now’s the time to stock up on extra paper towel, napkins, aluminum foil, and the like. Make sure you have enough place settings for your guests. While you’re at it, make sure you have enough room at the table and chairs as well. Odds are, you’ll have some guests helping you out with chopping, and turkey carving. I seem to only notice how dull my knives have become when a guest of mine comments that they can barely cut through a tomato. Get out your sharpening kit and do it early. I keep a lot of my recipes online, and it’s honestly a huge hassle to have to find them in a hurry over the holiday season. I created a Google Document with links to all of my favorite holiday recipes, so they’re all in one place and easy to find. Printing them out would work well too. Clean and repair your appliances. Now’s the time to clean that layer of grime off the oven, and repair any loose parts. If your old appliances just aren’t cutting it anymore, then now’s a perfect time to upgrade. Our current oven is about 10 years old, and while it’s not broken, it definitely has a few issues. It seems to burn things from the bottom, and it’s just to hot. I’ve had my eye on the LG 6.9 Cu. ft. gas range Double Oven with ProBake at Best Buy for a while now. 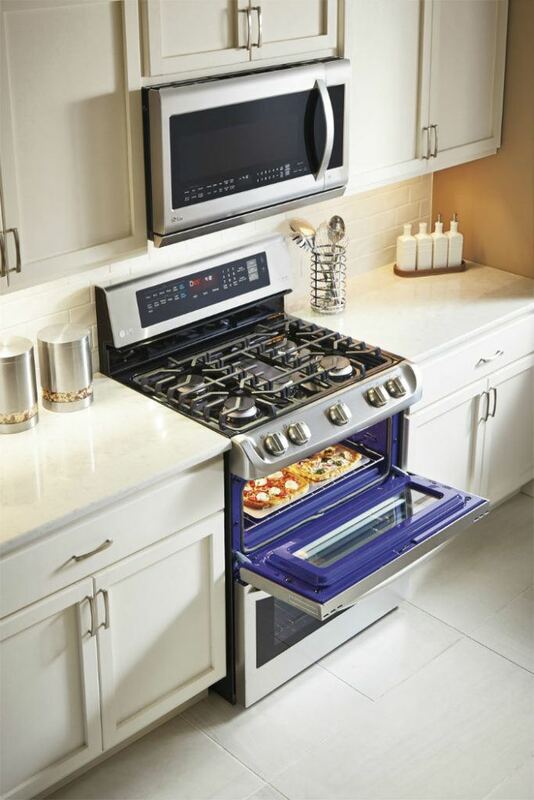 It has a fantastic feature that circulates air evenly throughout the lower oven. No more burning pie crusts for me! Even better, the ProBake Convection speeds cooking times for fast and flavorful meals. I’m all about faster pie baking! This oven would be perfect for baking pies. Pies are tricky beasts, and can brown too much if the heat isn’t quite right. Visit the Best Buy Prep for the Holidays Campaign Page here. 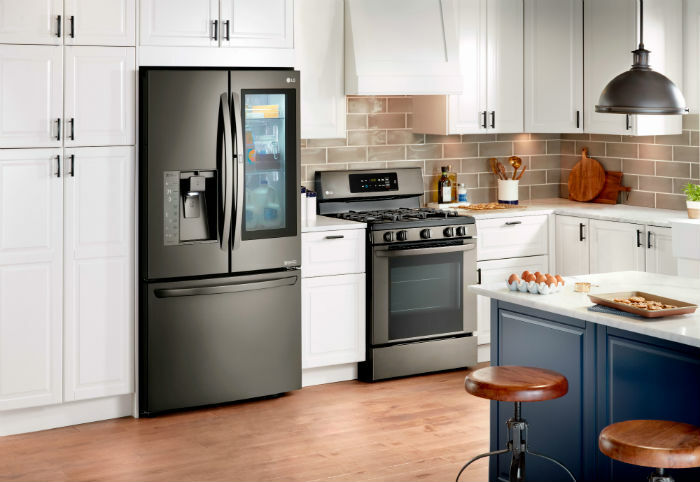 If you’re looking for another appliance, then Best Buy has a great selection of LG products. As you prep your home for entertaining during the holidays, you can count on our expert service to find you the right LG appliances at an unbeatable price. As I was looking at the sleek new LG InstaView door in door french door refrigerator, it occured to me that my fridge was more than a few years old as well. 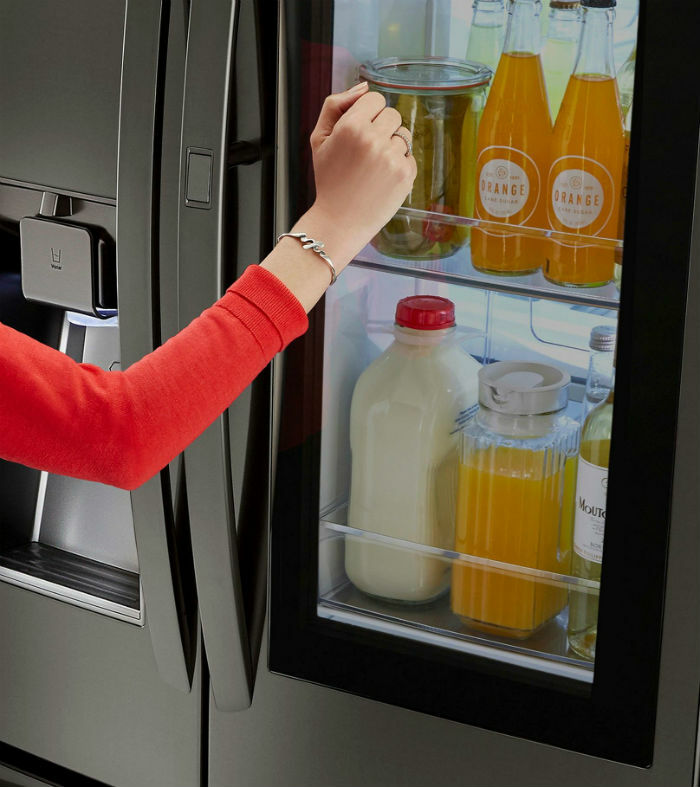 The LG Instaview has a sleek glass panel that illuminates with two quick knocks on the right-hand refrigerator door. This lets you see inside the easy-access compartment without ever opening the door. Right now, Best Buy has a great deal on where you can save up to $600 on the LG Kitchen Appliance Package! Just mosey on over to this link to check it out. You may end up saving yourself some good money!